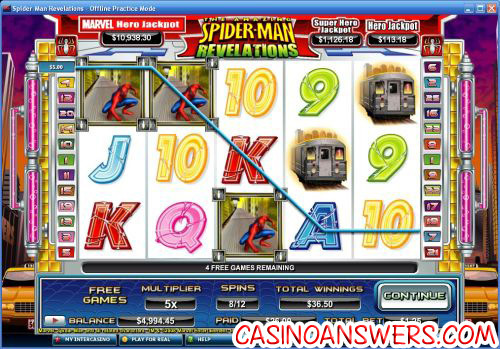 Spiderman Revelations Marvel Video Slot Guide & Review - Casino Answers! Spider-Man Revelations is the sequel to the previous Spider-Man video slot on the Cryptologic software. It’s a 5 reel, 25 line video slot that can be found at Cryptologic online casinos such as InterCasino and VIP Casino. We should note that Americans you’re unfortunately out of luck – you can’t play the marvel slots as the casinos that offer them currently are not available to the USA. For the rest of you – head on over to VIP Casino. The Substitute (or Wild) symbol is Spider-Man shooting a web. It substitutes for any of the symbols except Scatter. The Scatter symbol is the Spider-Man logo. If you get three logos, you will be brought to a new screen for the Doctor Octopus Feature. Spider-Man Revelations has three Progressive Jackpots: the Hero Jackpot (in the hundreds), the Super Hero Jackpot (in the thousands) and the Marvel Hero Jackpot (in the ten thousands). These Marvel Jackpots are awarded randomly. No matching symbols are required to win them. The size of the wager determines the chance of winning a jackpot, so the more you bet, the higher your chances are of winning. Try and defeat Doc Ock – try Spider-Man Revelations today! Where can I play the Spider-Man Revelations video slot? You can play Spider-Man Revelations at InterCasino. InterCasino is a great online casino for comic fans. 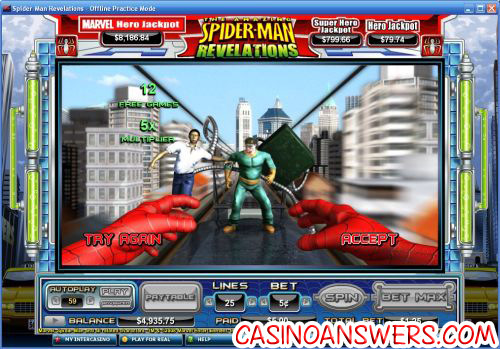 Not only can you play both Spider-Man slot machines, but you can also play other Marvel slots such as Blade, Elektra, Captain America, Daredevil, Elektra, Fantastic Four, Ghost Rider, Incredible Hulk, Incredible Hulk: Ultimate Revenge, Iron Man, Punisher, Silver Surfer, Sub-Mariner, Thor, Wolverine and X-Men. InterCasino also has DC Comics slots Batman, Superman and Wonder Woman. Does Spider-Man Revelations have a bonus game? Yes, if you get 3 or more Scatter symbols (Spider-Man logos), you will activate the Doctor Octopus Feature. This bonus game is like playing Deal or No Deal (with Doctor Octopus’ hostages instead of briefcases). You get two offers before you are forced to accept the third. Is there two types of Spiderman Slot Machines? What is the best Marvel Slot Machine? Where can I play Marvel Slots?